As research and development activities are inseparable part of my company – INTERIORPROTECT Ltd. – and I always strive to broaden our portfolio and horizons, I am considering expanding into other countries in the European Union and other European countries. 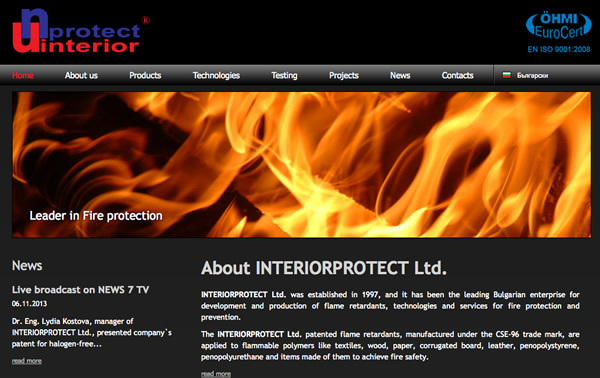 Established in 1997, INTERIORPROTECT Ltd. has been the leading Bulgarian enterprise for development and production of flame retardants, technologies and services for fire protection and prevention. INTERIORPROTECT Ltd. is the first private Bulgarian fire protection material company that acquired the ISO 9001 Quality Management System Certificate. The company has received awards for its inventions and patents and I recently presented the company’s patent for halogen-free flame retardants. While specific business know-how and innovative ideas are undoubtedly important, knowing how to communicate your knowledge and ideas to another business culture is no less crucial. Given the specificity of our business, I am well acquainted with the legislation in the different countries. Yet the website www.businessculture.org provides a good summary of the basic business communication “laws” that should be abided when one wants to do business in a foreign country. Although one might fall into the trap of thinking that business etiquette is the same everywhere, this website has compiled information from many different countries in one place showing some of the important differences that one needs to know to make a good impression. Even a country like Turkey whose culture many Bulgarians believe to know well has its peculiarities. Having information how to say basic words and greetings in the respective languages seems also useful. The website provides interesting tips on how to carry out negotiations in different business settings, what questions to consider beforehand and what topics to avoid. I believe that www.businessculture.org presents a well written guide for small and medium sized companies that want to venture out and do business in foreign countries but do not have the time to invest in a lot of research themselves and I would recommend it to fellow managers.